Switzerland’s Marcel Wildhaber and American Katie Compton won the elite men’s and women’s races at round four of the National Trophy Series in Milton Keynes on Sunday, as British riders were pushed off the podium. 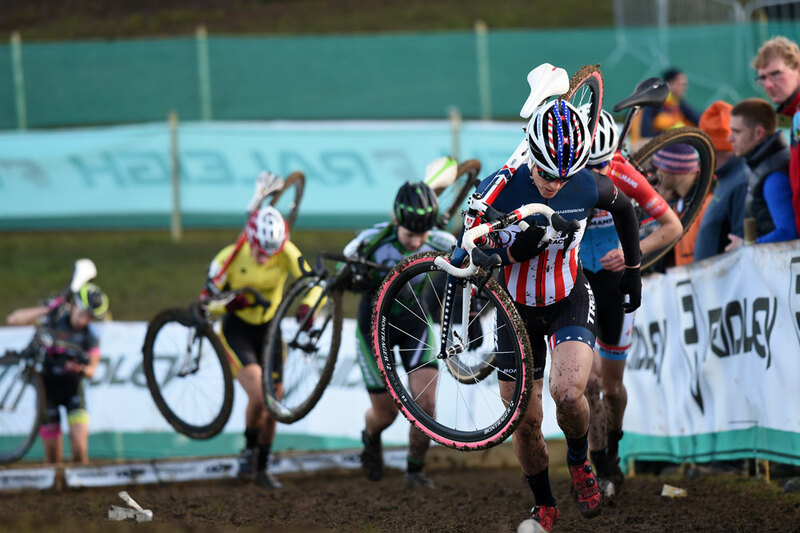 Wildhaber, the 29-year-old Scott Racing rider, edged to victory by just one second ahead of race-long companion David van der Poel (BKCP-Powerplus) from the Netherlands, while American Jonathan Page (Xcel-LED) took third. Best British finisher was Ian Field (Hargroves Cycles), who had been battling with Page until a fall just as he came out of the pits gave his rival the impetus to attack and leave Field to salvage fourth. In the women’s race Compton (Trek Factory Racing) was a class apart, crossing the line more than a minute ahead of her nearest rival, Luxemburg’s Christine Majerus (Boels Dolmans). Third spot went to Karen Verhestraeten (Kleur op Maat), while best British female was 17-year-old Yorkshire rider Amira Mellor, the Paul Milnes RT rider who was wearing the race leader’s jersey and extended her lead with fourth spot, 2-33 behind Compton. The course was very sticky, with a lot of the rain from Saturday’s World Cup having dried slightly, meaning many of the top riders were swapping bikes every lap. And it was on one of those bike changes that Field’s chances of a podium finish arguably ended, when he hit the deck and lost around 25 seconds on Page, who attacked immediately to extend the damage to an eventual 1-51 over the British champion by the end. “It was OK, I wasn’t expecting too much,” said Field afterwards. “It’s always difficult the day after the World Cup, which was a super tough race on a hard course. I just wanted to get points for the overall, and I was first Brit. With my legs on the day that was the best I could do. In other categories, the junior men’s race – which was held as an opener on Saturday before the World Cup – was won by American visitor Gavin Haley (Red Zone CT), who was 29 seconds ahead of Arthur Green (Matlock CC), with Thomas Craig (Pioneer-Scott Synchros) third, another 30 seconds off the pace. Ian Taylor (Jedi Cyclesport) was victorious once again in the over-40 veterans race, leaving Darren Atkins second. And Chris Young (Pedalsport CC) took a popular victory in the over-50s race ahead of Phil Roach and Tim Gould. And in the veteran women’s race, Marie Jackson (Paul Milnes RT) won comfortably from over-50 rider Tracey Fletcher (Team Empella) to make the overall rankings even closer. There was a 1-2 for the Tulett family, with Hargroves Cycles rider Dan winning the Under-16 Boys race and team-mate and brother Ben winning the Under-14 Boys category, while Emily Wadsworth (Beeline Bicycles) winning her first round in the Under-16 Girls, while Elena Smith (Fossa Racing) was fastest Under-14 female.